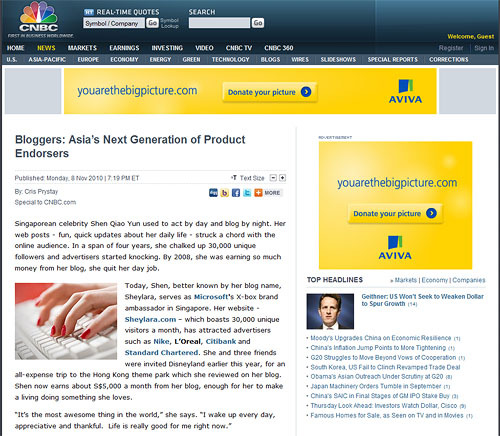 I got a call last week from CNBC reporter Cris Prystay, wanting to interview me for a story on CNBC.com. It was nice. We spent about 20 minutes chatting about my blogging career. I feel quite lucky that, so far, all my interviews have been quite positive. I mean, I haven’t gotten any reporters trying to wrangle nasty stories from me or purposely misquoting me just to make me look bad. This CNBC interview was for a business story, anyway, so I wasn’t expecting anything nasty, although I didn’t know the angle of the story when we were chatting. Turns out I’m a case study for a bigger story on how blogs are today a dominant influence in consumer markets. I feel quite amused. And somewhat flattered, I suppose. Anyway, what the report didn’t mention is how thankful I am to have supportive readers who enjoy reading what I write. That’s what keeps me happy and inspired. Click here to read the full report on CNBC.com. So, I just wanna take this opportunity to once again thank my readers for reading. You’re the reason for my existence! And thanks for the mention, CNBC! ‘Bout time! Recognize, Universe! Shey Diddy for World Prez, 2012!